Wondering which colleges and universities in Ohio produce the highest-paid graduates? PayScale has Ohio colleges ranked by salary potential. With one of the five largest state university systems, Ohio is well known for schools like Ohio State University, Bowling Green State University, Oberlin College, Kenyon College and University of Cincinnati. 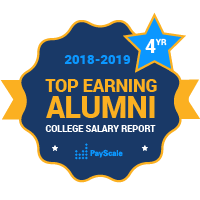 PayScale has salary information for graduates of these four-year colleges in the state so that you can find the best Ohio universities by alumni salary. Actor and filmmaker George Clooney graduated from the University of Cincinnati, a school known not only for its arts programs but also for its health and science programs. This doesn’t make it the Ohio school with the highest percentage of STEM degrees, however that designation belongs to Case Western. Ohio is home to lots of prominent liberal arts schools, including Wittenberg University, Kenyon College, Otterbein College and The College of Wooster. Ironically, some of the top industries in the state include aerospace and defense, bioscience and energy development.